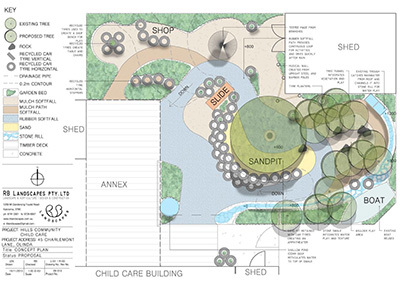 Richard Bellemo and the RB Landscapes team were excited to be given the challenge of designing the Hills Community Preschool outdoor area in Olinda. The preschool wishes to transform the existing tan bark area into an informal play space inspired by natural elements. Using the existing variation in grade, the new proposal uses low cost, recycled elements such as tyres to create a landscape rich in opportunity for prescribed and non-prescribed play. The proposal is centred around a sandpit and water interaction channel. The team will begin construction in the mid 2013.